It’s A Man and my 6 year-anniversary today. At least, the anniversary of when we started seeing one another. The one we celebrate ‘properly’ is in July, and marks both when we met and got engaged (and, after next year, our wedding day). We had no plans and have had a lazy day reading, punctuated by spaghetti on toast and a somewhat more adventurous venison stew for dinner. We bought the venison when it was on offer a few weeks ago and stuck it in the freezer. The recipe is loosely based on one in the Ballymaloe Cookery Course book, except for being heavily based around what we had in the cupboards. According to Ms Allen, as venison is a lean meat it benefits from being ‘larded and barded’; the former referring to the meat being cooked with the fat of another cut and the latter to the meat being wrapped around with some fatty meat (often bacon). As I had been intending to cook this dish, I reserved the fat and bones leftover from Friday’s Oxtail stew as there was still plenty of cooking left in them (the bones intended to add to the flavour of the stock). However, unsmoked bacon or lardons are what is recommended in the book. Mine also includes chestnuts, which were recommended by my mum. Any cooked chestnuts would be fine for this – roast your own if you like. Mine were ready-roasted and frozen, defrosted before use. They might look like baby onions, but I promise they were chestnuts! In hindsight, perhaps bowls would have been a better idea for this one! Mix the wine, whisky, herbs, onions and oil in a bowl and add the venison. Marinade for several hours, preferably at least overnight. Fry the lardons in a medium-hot pan, until the fat begins to run and the meat to brown. Place the meat in a slow-cooker bowl or oven-proof dish. Remove the venison from the marinade and coat in seasoned flour. Fry in the bacon fat until it has started to brown. Add to the slow-cooker pot. Remove the onions from the marinade and fry with the carrots and garlic in the bacon fat until the onion has started to soften. Add to the slow cooker pot. Deglaze the pan with the remaining marinade. Pour into the slow-cooker pot. Warm enough beef stock to cover the venison and add to the pot. Stir everything well and cook on ‘low’ for around 4 hours (or in the oven on a low heat). Add the chestnuts to the pot near the end of cooking to heat through thoroughly. 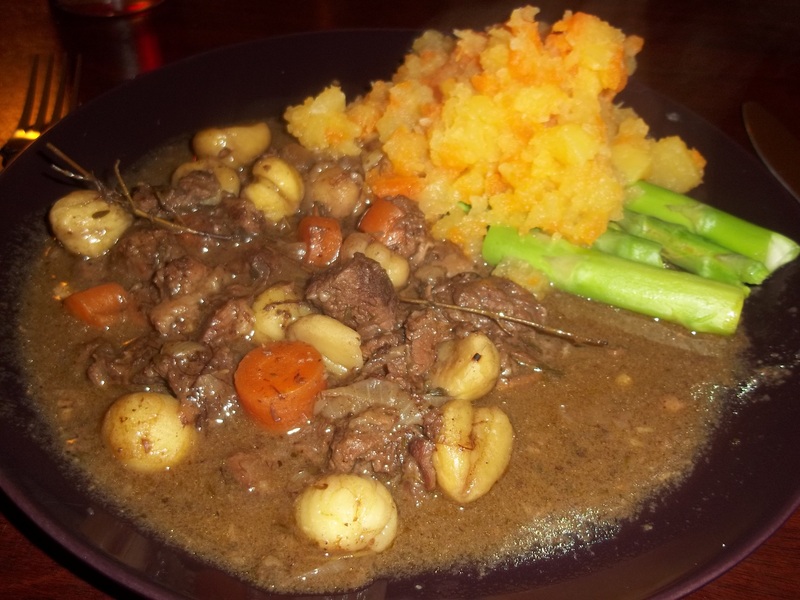 Serve the stew with swede and onion mash and steamed vegetables (we had asparagus again). The gravy is quite thin, but incredibly flavoursome – mix it with the mash to mop it all up.